The Croats of Bosnia and Herzegovina, often referred to as Bosnian Croats, are the third most populous ethnic group in that country after Bosniaks and Serbs, and are one of the constitutive nations of Bosnia and Herzegovina. They are a native ethnic group of Bosnia and Herzegovina. Croats of Bosnia and Herzegovina have made significant contributions to the culture of Bosnia and Herzegovina. Their mother tongue is Croatian, and most identify as Roman Catholic, although there is a small minority of atheists. 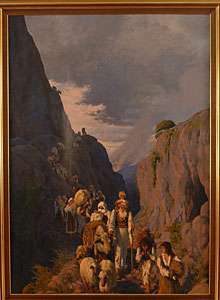 From the 15th to the 19th century, Croats in modern-day Bosnia and Herzegovina were often persecuted under the Ottoman Empire, causing many of them to flee the area. In the 20th century, political turmoil and poor economic conditions caused more to emigrate. Ethnic cleansing within Bosnia and Herzegovina in the 1990s saw Croats forced to different parts of Bosnia-Herzegovina, although having lived in numerous regions prior to the Bosnian War. According to the report by the Bosnia and Herzegovina statistics office, on the census of 2013 there were 544,780 Croats living in Bosnia and Herzegovina. Croats settled the areas of modern Croatia and Bosnia and Herzegovina in the 7th century. There, they assimilated with native Illyrians and Romans during the great migration of the Slavs. The Croats adopted Christianity and began to develop their own culture, art, and political institutions, culminating in their own kingdom, which consisted of two principalities: Pannonian Croatia in the north, and Dalmatian Croatia in the south. Red Croatia, to the south, was land of a few minor states. One of the most important events of the Croats in Bosnia and Herzegovina in the early Middle Ages is the First Croatian Assembly held in 753 in Županjac (present-day Tomislavgrad). 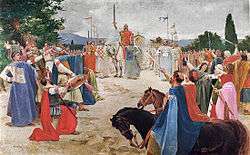 The second major event was the coronation of Tomislav, the first King of Croatia, in ca. 925, in the fields of Županjac. By this act, Pannonian Croatia and Dalmatian Croatia formed a united Croatian kingdom, which included Dalmatia and part of Bosnia and Herzegovina, Pannonia (eastern Slavonia and northeastern Bosnia), and Savia (western Slavonia). A basic feature of that period in Croatia is its isolation from European cultural and political events which resulted in a small number of secular monuments. In 1102 Croatia entered into a union with the Kingdom of Hungary. After this, Bosnia, which was earlier part of the Kingdom of Croatia, started to disassociate with Croatia. At first, Bosnia become a separate principality under Kulin who managed to solidify Bosnian autonomy at the expense of more powerful neighbours, but only in the 14th century did Bosnia become a formidable state. In the 14th century, King Tvrtko I conquered part of western Serbia and later part of the Kingdom of Croatia, which he accomplished by defeating various Croatian nobles and supporting Hungary. Thus, the Kingdom of Bosnia emerged, but part of present territory of Bosnia and Herzegovina remained in the Kingdom of Hungary-Croatia. Regarding religion, Bosnia was closer to Croatia than the Orthodox lands to the east, and the Diocese of Bosnia is mentioned as Catholic in the 11th century, and later fell under the jurisdiction of the Archdiocese of Split and in the 12th Century under the jurisdiction of the Diocese of Dubrovnik. Another connection of Bosnia with Croatia is that Bosnian rulers always used the political title "ban" in similarity with their Croatian counterparts. The specific religion in medieval Bosnia was Bogomilism and Bosnian Church, so some of the notable feudal lords in Medieval Bosnia were followers of this religion, such as Duke Hrvoje Hrvatinić. Due to the scarcity of historical records, there are no definite figures dealing with the religious composition of medieval Bosnia. However, Croat scholars generally suggest that a majority of Bosnia's medieval population were Catholics who, according to Zlopaša, accounted for 700,000 of 900,000 of the total Bosnian population. Some 100,000 were Bogomils and other 100,000 were Orthodox Christians. In the middle of the 15th century, Turks started to invade Bosnia. In 1451 they took Vrhbosna province and conquered Bosnia in 1463. Herzegovina was conquered in 1481, while northern Bosnia was still under Hungary and Croatia until 1527, when it was conquered by the Turks. After the Turkish conquest, many Catholic Bosnians converted to Islam, and their numbers in some areas shrank as many fled from fear of conversion and persecution. The Ottoman conquest changed the demographics of Bosnia and Herzegovina, reducing the number of Catholics, and eliminating the Bogomilic Bosnian Church, whose members apparently converted to Islam en masse. The present-day boundaries of Bosnia and Herzegovina were made in 1699, when the Treaty of Karlowitz was signed in order to establish peace between Austria and the Ottoman Empire. Another significant event for Bosnian Croats is the boundary established by an agreement between the Republic of Ragusa and the Ottoman Empire, where Ragusans promised to give in part of their territory in Neum to the Ottomans in order to protect themselves from the Venetian Republic. The activity of the Catholic Church was limited, while the Ottomans preferred the Orthodox Church because Catholicism was the faith of Austria, the Ottoman enemies, while Orthodoxy was common in Bosnia, and thus it was more acceptable to the Ottomans. In the first 50 years of Ottoman rule, many Catholics fled from Bosnia. A number of Catholics also converted to Orthodox Christianity. Franciscans were only Catholic priests to be active in Bosnia. Before the Ottomans arrived in Bosnia, there was 35 Franciscan monasteries in Bosnia and four in Herzegovina. Some monasteries were destroyed and some were converted to mosques. In the 1680s there was only 10 Franciscan monasteries left in Bosnia. The Catholic Church in Bosnia divided its administration into two dioceses, one was the Croatian Bosnia diocese, part which was not conquered by the Ottomans, and other was Bosna Srebrena diocese. Between 1516 and 1524, a planned persecution and forced Islamization of Catholics occurred in Bosnia and Herzegovina. In that year, Franciscan monasteries in Kraljeva Sutjeska, Visoko, Fojnica, Kreševo and Konjic, and later in Mostar. It is believed that during that time, some 100,000 Croats converted to Islam. In 1528 the Ottomans conquered Jajce and Banja Luka, thus destroying the Croatian defence line on Vrbas river. After that conquest, Croatia reduced to around 37,000 km². During the 18th century, Turkish rule in Bosnia and Herzegovina started to weaken, and after the Napoleonic Wars their rule rapidly decreased; the Ottoman Empire lost its demographic, civilization, and other reserves for military and territorial expansion, while the Austrian Empire, as the rest of the European countries, gained them. From 1815 to 1878 the Ottoman's authority in Bosnia and Herzegovina was decreasing. After reorganization of the Ottoman army and abolition of the Jannisaries, Bosnian nobility revolted, led by Husein Gradaščević, who wanted to establish autonomy in Bosnia and Herzegovina and to stop any further social reforms. During the 19th Century, various reforms were made in order to increase freedom of religion which sharpened relations between of Catholics and Muslims in Bosnia and Herzegovina. Soon, economic decay would happen and nationalist influence from Europe came to Bosnia and Herzegovina. Since the state administration was very disorganized and the national conscience was very strong among the Christian population, the Ottoman Empire lost control over Bosnia and Herzegovina. On 19 June 1875 Catholic Croats, led by Don Ivan Musić, revolted because of high taxes in West Herzegovina. Their goal was to subordinate Bosnia to the rule of the Emperor of Austria, respectively King of Croatia. During the revolt, for the first time Bosnian Croats used the flag of Croatia. Soon after, the Orthodox population in East Herzegovina also revolted, which led to the Herzegovina Uprising. Turks were unable to defeat the rebels, so Serbia and Montenegro took advantage of this weakness and attacked the Ottoman Empire in 1876, soon after the Russian Empire did the same. The Turks lost the war in 1878, and this resulted in over 150,000 refugees who went to Croatia. After the Congress of Berlin was held in same year, Bosnia and Herzegovina was transferred to the Austro-Hungarian Empire. Even after the fall of the Ottoman rule, the population of Bosnia and Herzegovina was divided and antagonistic. In the Kingdom of Croatia, Croatian politicians saw unification of the Kingdom of Dalmatia and Istria with Croatia. Another ambition of Croatian politicians was to incorporate the Condominium of Bosnia and Herzegovina into the Kingdom of Croatia. The Bosnian Governor, Béni Kállay found his support in religious institutions to govern more easily. Soon, the Austrian Emperor gained support to name Orthodox metropolitans and Catholic bishops and to choose Muslim hierarchy. The first Catholic archbishop was Josip Stadler. Both apostolic vicarates, Bosnian and Herzegovinian, were abolished, and instead three dioceses were founded; Vrhbosna diocese with a seat in Sarajevo, Banja Luka diocese with a seat in Banja Luka and Mostar-Duvno diocese with a seat in Mostar. At the time, Bosnia and Herzegovina was facing a large modernization. Between 180,000 and 200,000 people inhabited Bosnia and Herzegovina, the majority were Croats, Serbs, Muslims and in smaller percentages Slovenes, Czechs and others. During this period, the most significant event is Bosnian entry to European political life and the shaping of ethnic Croats in Bosnia and Herzegovina into a modern nation. At the end of the 19th century, Bosnian Croats founded various reading, cultural and singing societies, and at the beginning of the 20th century, a new Bosnian Croat intelligentsia played a major role in the political life of Croats. The Croatian Support Society for Needs of Students of Middle Schools and High Schools in Bosnia and Herzegovina was founded in 1902, and in 1907 it was merged with Croatian Society for Education of Children in Craft and Trade, also founded in 1902, into Croatian Cultural Society Napredak (Progress). Napredak educated and gave scholarships to more than 20,000 students. Students of Napredak were not only Bosnian Croats, but also Croats from other regions. Kallay tried to unify all Bosnians into a single nation of Bosniaks, but he failed to do so after Bosnians created their national political parties. Before the annexation of Bosnia and Herzegovina in 1908, the Croat People's Union (HNZ) become a political party; its ideology was very similar to that of the Croatian-Serbian Coalition in Croatia. In 1909, Stadler opposed such a policy and founded a new political party, the Croat Catholic Association (HKU), an opponent of the secular HNZ. HKU emphasized clerical ideals and religious exclusivity. However, Bosnian Croats mostly supported the secular nationalist policy of the HNZ. HNZ and Muslim Nation Organization formed a coalition which ruled the country from 1911 until the dissolution of the Bosnian parliament in 1914. After the World War I, Bosnia and Herzegovina became part of the internationally unrecognized State of Slovenes, Croats and Serbs which existed between October and December 1918. In December 1918, this state united with the Kingdom of Serbia as Kingdom of Serbs, Croats and Slovenes,which was renamed the Kingdom of Yugoslavia in 1929. This new state was characterized by Serbian nationalism, and was a form of "Greater Serbia". Serbs held control over armed forces and politics of the state. With around 40% Serbs living in Bosnia and Herzegovina, Serbian leadership of the state wanted to implement a Serbian hegemony in this region. Bosnian Croats constituted around a quarter of the total Bosnian population, but they did not have a single municipality president. The regime of the Kingdom of Yugoslavia was characterized by limited parliamentarism, drastic elective manipulations and later King Alexander's 6 January Dictatorship, state robbery present outside Serbia and political killings (Milan Šufflay, Ivo Pilar) and corruption. Yugoslavia was preoccupied with political struggles, which led to the collapse of the state after Dušan Simović organized a coup in March 1941 and after which Nazi Germany invaded Yugoslavia. King Alexander was killed in 1934, which led to the end of dictatorship. In 1939, faced with killings, corruption scandals, violence and the failure of centralized policy, the Serbian leadership agreed a compromise with Croats. On 24 August 1939, the president of the Croatian Peasant Party, Vladko Maček and Dragiša Cvetković made an agreement (Cvetković-Maček agreement) according to which Banovina of Croatia was created on territory of Sava and Littoral Banovina and on districts of Dubrovnik, Šid, Brčko, Ilok, Gradačac, Derventa, Travnik and Fojnica. Around 30% of the present-day territory of Bosnia and Herzegovina become part of Banovina of Croatia. Those parts had a Croatian majority. Creation of Banovina of Croatia was one of the solutions to the "Croatian issue". After the collapse of Yugoslavia, a majority of Croats supported the establishment of the Independent State of Croatia (NDH)' as did the Croats of Bosnia and Herzegovina..NDH was established on 10 April 1941. However, later during the war, the Croats became divided; one side supported NDH while the other, the Yugoslav Partisans, supported the creation of communist Yugoslavia. Serbian Chetniks were also engaged in a war against the NDH and Partisans. Soon after it was created, NDH faced a brutal civil war, with the fiercest fighting in Bosnia and Herzegovina. After NDH and the Axis Forces lost the war in May 1945, Croatian soldiers and civilians retreated to the British occupied zone in Austria in Bleiburg. Many of them were killed by the Yugoslav Partisans in an event remembered as the Bleiburg massacre or the "Way of the Cross" (Križni put). During the communist era, Bosnia and Herzegovina were populated by three ethnic groups: the Croats, the Serbs and the Muslims (later re-designated as Bosniaks). Many Croats declared their nationality as Yugoslav and like all ethnic groups at the time, Croats collaborated and were friends with their fellow citizens, whilst also maintaining their culture, primarily through their following of Catholicism. Citizens of the Socialist Republic of Bosnia and Herzegovina voted for the independence of Bosnia and Herzegovina in the referendum that was held between 29 February and 1 March 1992. The referendum question was: "Are you in favor of a sovereign and independent Bosnia-Herzegovina, a state of equal citizens and nations of Muslims, Serbs, Croats and others who live in it?" Independence was strongly favoured by Bosniak and Bosnian Croat voters, but the referendum was largely boycotted by Bosnian Serbs. The total turn out of voters was 63.6% of which 99.7% voted for the independence of Bosnia and Herzegovina. On 5 April 1992, Serb forces started the Siege of Sarajevo. 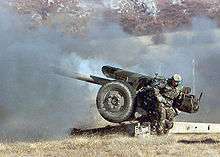 On 12 May, Yugoslav People's Army left Bosnia and Herzegovina and left most of the arms to the Army of Republika Srpska, headed by Ratko Mladić. The first unit to oppose Serb forces in Bosnia and Herzegovina was the Croatian Defence Forces (HOS) founded by Croatian Party of Rights of Bosnia and Herzegovina on 18 December 1991. The Croatian Community of Herzeg-Bosnia established its own force, the Croatian Defence Council (HVO) on 8 April 1992. HVO consisted from 20-30% of Bosniaks who joined HVO because local Muslim militias were unable to arm themselves. Croatian Community of Herzeg-Bosnia was founded on 18 November 1991 as a community of municipalities where majority of population were Croats. In its founding acts, Herzeg-Bosnia had no separatist character. The Croatian Republic of Herzeg-Bosnia was declared by the Bosnian Croat leadership as a temporary region, which after war ended, would again become part of a united Bosnia and Herzegovina. At the beginning of the Bosnian War, Bosnian Croats were first to organize themselves, especially Croats in western Herzegovina who were already armed. At the end of May 1992, Croats launched a counter-offensive, liberating Mostar after a month of fighting. Also, in central Bosnia and Posavina, Croatian forces stopped the Serbian advance, and in some places they repelled the enemy. On 16 June 1992, President of Croatia, Franjo Tuđman and President of Bosnia and Herzegovina, Alija Izetbegović signed an alliance according to which, Bosnia and Herzegovina legalized the activity of Croatian Army and Croatian Defence Council on its territory. Bosnian Croat political leadership and the leadership of Croatia urged Izetbegović to form a confederation between Bosnia and Herzegovina and Croatia, but Izetbegović denied this since he tried to represent Serbian interests as well as those of Bosniaks and Croats. The Bosnian Croat leadership was irritated by Izetbegović's neutrality, so Mate Boban threatened to pull back the HVO from actions in Bosnia. Since the UN implemented embargo to Bosnia and Herzegovina on the import of arms, Bosniak and Croat forces had difficulties fighting Serbian units, which were supplied with arms from the Middle East, just before the outbreak of war. However, after Croat and Bosniak forces reorganized in late May 1992, the Serbian advance was halted and their forces mostly remained in their positions during the war. The tensions between Croats and Bosniaks started on 19 June 1992, but the real war began in October. The Croat-Bosniak War was at its peak during 1993. In March 1994, the Bosniak and Croat leadership signed the Washington agreement, according to which, the Army of the Republic of Bosnia and Herzegovina (ARBiH)-controlled and HVO-controlled areas were united into the Federation of Bosnia and Herzegovina. After the Washington agreement was signed, the Croatian Army, HVO and ARBiH liberated southwestern Bosnia and Herzegovina in seven military operations. In December 1995, the Bosnian War ended with the signing of the Dayton agreement. However, the same agreement caused problem in Bosnia and Herzegovina, and was largely ineffective. According to the information published by the Research and Documentation Centre in Sarajevo, 7,762 Croats were killed or missing. From the territory of the Federation of Bosnia and Herzegovina, 230,000 Croats were expelled, while from territory of Republika Srpska, 152,856 Croats were expelled. Croats form a demographic majority in these municipalities, Mostar, Široki Brijeg, Ljubuški, Livno, Čitluk, Tomislavgrad, Čapljina, Orašje, Posušje, Žepče, Grude, Vitez, Busovača, Kiseljak, Prozor-Rama, Odžak, Stolac, Neum, Domaljevac-Šamac, Usora, Kreševo, Kupres, Dobretići , Ravno, Novi Travnik .Municipalities in which Croats comprise a third of the population are Uskoplje, Vareš and Glamoč. Municipalities in which Croats made around 15% of the population are Brčko, Drvar and Grahovo. Municipalities with a Croatian majority (14 of them) made a united area from Kupres in the northwest to Ravno in the southeast of Bosnia and Herzegovina, while 12 municipalities represent enclaves with Croatian majorities. Mostar is the city with the largest population of Croats in Bosnia-Herzegovina. Some estimates state that the population of medieval Bosnia, was between 850,000 - 900,000 inhabitants, of which 750,000 were Catholics (85,22%), 80,000 were Bogomils (9,09%) and 50,000 were Orthodox Christians (5,68%). During Ottoman rule, the number of Bosnian Catholics decreased drastically. When the Turks conquered Bosnia in 1463, according to their data, they took 100,000 Catholics into captivity and 30,000 Catholic boys to serve as janissaries. In 1558/59, in present-day Bosnia and Herzegovina, there was 360,000 Catholics (57%), 220,000 Muslims (34%) and 55,000 Orthodox Christians (9%). In 1624, there was around 450,000 Muslims (67%), 150,000 Catholics (22%) and 75,000 Orthodox Christians (11%). In 1776, according to Klaić, there was around 50,000 Catholics in Bosnia. However, the Turkish censuses were biased, and they only numbered the houses and later exclusively included the male population. During Austrian-Hungarian rule, the number of Croats started to increase when 180,000 to 200,000 people arrived to Bosnia and Herzegovina, of which the majority were Croats. According to the Croatian author Vjekoslav Klaić in 1878, there were 1,291,393 Croats, comprising 96-97% of the total population. He considered present-day Bosniaks and Serbs of Bosnia and Herzegovina as well as Croats to be part of Croatian nationality. According to him, there was 646,678 Orthodox Christians (respectively Serbs, 48.4%), 480,596 Muslims (35.9%), and 207,199 Catholics (respectively Croats, 15.5%) and 3,000 Jews (0.2%). In 1895, Bosnia and Herzegovina had 1,336,091 inhabitants, of which there was 571,250 Orthodox Christians (42.76%), 492,710 Muslims (36,88%), 265,788 Catholics (19.89%), 5,805 Jews (0.43%) and 53 others (0.04%). The main characterization of Kingdom of Yugoslavia was a Serbian attempt to implement Serbian hegemony and to serbianize rest of the population. According to the 1931 census, Bosnia and Herzegovina had 2,323,787 inhabitants of which Serbs made 44.25%, Muslims 30.90%, Croats 23.58% and others made 1.02% of the total population. The first Yugoslav census recorded a decreasing number of Croats; from the first census in 1948 to the last one from 1991, the percentage of Croatians decreased from 23% to 17.3%, even though the total number increased. According to the 1953 census, Croats were in the majority in territories which became part of Banovina of Croatia in 1939. Their total number was 654,229, that is 23,00% of total Bosnian population. According to the 1961 census, Croats made up 21.7% of total population, and their number was 711,660. After that, districts were divided into smaller municipalities. According to the 1971 census, Croats were 20.6% of total population, and their number was 772,491. According to the 1981 census, Croats made up 18.60% of total population, and their number was 767,247. In comparison to the 1971 census, for the first time the percentage of Croats was below 20%, and after 1981, their percentage continued to reduce. From 1971 to 1991, the percentage of Croats fell due to emigration into Croatia and Western Europe. Nevertheless, the fall in population percentage is only absent in western Herzegovina municipalities where Croats account for more than 98% of the population. According to the 1991 census, Croats were 17.3% of the total population, and their number was 755,895. The total number of Croats in Bosnia and Herzegovina continued to reduce, especially after the Bosnian War broke out in 1992. Soon, an exodus of Bosnian Croats occurred when a large number of Croats were expelled from central Bosnia and Posavina. According to the 1996 census, made by UNHCR and officially unrecognized, there was 3,919,953 inhabitants, of which 571,317 (14.57%) were Croats. In the territory of the Croatian Republic of Bosnia and Herzegovina, the percentage of Croats slightly changed, although,their total number reduced. The first education institutions of Bosnian Croats were monasteries, of which the most significant were those in Kreševo, Fojnica, Kraljeva Sutjeska and Tolisa, and later monasteries in Herzegovina, of which most significant are those in Humac and Široki Brijeg. The most significant people workingfor the elementary education of Bosnian Croats in the 19th century were Ivan Franjo Jukić and Grgo Martić, who founded and organized elementary schools throughout Bosnia and Herzegovina. In 1887, many elementary schools were founded in Bosnia and Herzegovina along with the Order of Sisters of St. Francis, whose classes were led methodologically and professionally, so Bosnian Croat schools were, at the end of Ottoman era and beginning of Austrian-Hungarian occupation, the same as elementary schools in rest of Europe. The educational system of Bosnia and Herzegovina during communism was based on a mixture of nationalities and the suppression of Croat identity. With the foundation of Croatian Community of Herzeg-Bosnia, Bosnian Croat schools took the educational system from Croatia. At the same time, University Džemal Bijedić of Mostar was renamed to University of Mostar with official Croatian language. This university is the only one in Bosnia and Herzegovina to use Croatian as official language. After signing the Dayton accords, jurisdiction over education in Republika Srpska was given to RS Government, while in Federation, jurisdiction over education was given to the cantons. Municipalities with Croat majority or significant minority, schools with Croatian language as official one also exist, while on territories were there is only a small number of Croats, Catholic centres perform education. Another education institutes are HKD Napredak, Scientific Research Institute of University of Mostar, Croatian Lexicographic Institute of Bosnia and Herzegovina and Institute for Education in Mostar. Croats of Bosnia and Herzegovina speak Croatian, a standardized variety of Serbo-Croatian language, spoken by the people of Bosnia and Herzegovina. Even though most of them speak in the Ijekavian, also the norm among Bosniaks and Bosnian Serbs, Ikavian is also used and was widespread in larger parts of Bosnia. Croats of Bosnia and Herzegovina, as well as other two constitutive nations, have their representative in the Presidency of Bosnia and Herzegovina. Presidency has three members, one Bosniak, one Croat and one Serb. Bosniak and Croat are elected in the Federation of Bosnia and Herzegovina, while Serb is elected in the Republika Srpska. Current Croat member of the Presidency is Dragan Čović of the HDZBiH. Vice-Chairman of the Council of Ministers of Bosnia and Herzegovina is also a Croat, Marinko Čavara of the Croatian Democratic Union. The Parliament of the Federation of Bosnia and Herzegovina consists also out of two chambers, House of Representatives, that consists of 98 members, and House of Peoples that consists of 58 members. Members of the House of Representatives are elected directly by the citizens of Bosnia and Herzegovina, while members of the House of Peoples are selected by the cantonal assemblies. There are 17 representatives in the House of Peoples of each constitutive nation, Bosniaks, Croats and Serbs. Other 7 representatives are those of national minorities. In electing the President and two Vice-Presidents of the Federation, at least one third of the delegates of the respective Bosniak, Croat or Serb caucuses in the House of Peoples may nominate the President and two Vice presidents of the Federation. The election for the President and two Vice Presidents of the Federation shall require the joint approval of the list of three nominees, by a majority vote in the House of Representatives, and then by a majority vote in the House of Peoples, including the majority of each constituent people’s caucus. Current President of the Federation of Bosnia and Herzegovina is Živko Budimir of the Croatian Party of Rights. The Government of the Federation of Bosnia and Herzegovina needs to be composed out of 16 ministers, 8 Bosniaks, 5 Croats and 3 Serbs. Currently, there are several Croatian political parties in Bosnia and Herzegovina, many corresponding to parties within Croatia itself. The Croatian Democratic Union of Bosnia and Herzegovina (HDZ), Croatian Democratic Union 1990 (HDZ 1990), and the Croatian Party of Rights of Bosnia and Herzegovina (HSP BiH) are the most popular parties. The Croatian Peasant Party of Bosnia and Herzegovina (HPP) and the New Croatian Initiative (NHI) are relatively minor Croatian parties. Croatian Democratic Union was founded in 1990 and is major political parties among Bosnian Croats, being the most powerful during the Bosnian War (1992–1995) and existence of the Croatian Republic of Herzeg-Bosnia (1991-1994). CDU is Christian democratic, libertarian and pro-Europeanist political party. Croatian Democratic Union 1990 is a split party of the Croatian Democratic Union, founded in 2006, however, their ideology is very similar to one of the HDZ. HDZ 1990 is also Christian democratic, libertarian and pro-Europeanist party. Croatian Party of Rights was also very popular during the Bosnian War, even among Bosniaks since its military unit, Croatian Defence Forces, had a lot of both, Croat and Bosniak soldiers. CPR was founded also in 1990 but by 1992 it become inactive. In 1996 the CPR was renewed. CPR is a neoconservative political party. In the area near the Neretva river, a hellenized Illyrian tribe, the Darosi, spread cultural influences from Greece. Their capital Daorson on Oršćani near Stolac is today the most significant center of antic culture in Bosnia and Herzegovina. The complex of the terraced shrine near Gradac near Posušje, built in 183, was dedicated to a dead Roman Emperor, Marcus Aurelius. Late Roman art in Bosnia and Herzegovina was characterized by the building of vilas, Christian mausoleums, basilicas and oratories like Vila "Mogorjelo" near Čapljina (early 4th century). The influence of romanesque architecture arrived in Bosnia and Herzegovina across Croatia, but it was never completely accepted, only its elements were used. Such buildings are St. Luke's Tower in Jajce (15th century) or motives of stećak tombstones. Valuable manuscripts of Bosnian origin occur at this time. Hrvoje's Missal is the most significant art of the medieval Bosnian Croats, written in the 15th century. During the 15th and 16th century, Bosnia and Herzegovina was under Ottoman rule, which destroyed the influence of the Renaissance and Baroque, the impact of which was only present in Franciscan monasteries in Visoko, Kreševo, Fojnica, and Kraljeva Sutjeska. The first Bosnian Croat painters were educated in European academies in Vienna, Munich, Prague, Krakow, Budapest and Paris. Their education was funded by HKD Napredak. The most famous Bosnian Croat painters are Gabrijel Jurkić, Karlo Mijić, Branko Radulović and Petar Šain. Statuary was reduced to the memorial portraits, of which the most famous is that of Robert Frangeš Mihanović and Sputani genije, a statue on the grave of Silvije Strahimir Kranjčević built by Rudolf Valdec. After World War II, the Association of Artists of Bosnia and Herzegovina was founded along with the Painting State School and Sarajevo Art Gallery. Architectural Regionalism is seen in the 1970s on buildings such as department store Razvitak in Mostar (1970) and in Jajce (1976). The best example of Functionalism is the multiple award-winning hotel Ruža in Mostar (1979). Bosnian Croat literature consists of works written in the Croatian language by authors who originated from Bosnia and Herzegovina, and is considered part of Croatian literature. It consists of pre-Ottoman literature (first written monuments, texts of Bogomils, diplomatic and law documents, manuscripts on tombstones), Bosna Srebrena literature (prayer books, catechisms, collections of sermons, biographies of saints, monastery yearbooks, first historical works, poems and memoirs, travel books, grammars of Latin and Croatian languages and lexicographic works), national awakening literature (the foundation of various associations, reading rooms, libraries in which writing courses were held), the literature of Bosnian Muslims (various Bosniak writers made a significant impact on Croatian literature and were influenced by other Croat authors) and modern Bosnian Croat literature. 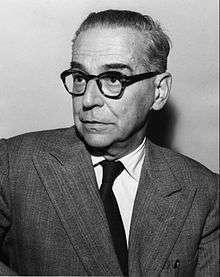 The best known contributors to the Bosnian Croat literature are Ivo Andrić, Ivan Aralica, Safvet-beg Bašagić, Enver Čolaković, Musa Ćazim Ćatić, Matija Divković, Mak Dizdar, Asaf Duraković, Fadil Hadžić, Mirko Kovač, Ivo Kozarčanin, Silvije Strahimir Kranjčević, Tomislav Ladan, Vitomir Lukić, Grgo Martić, Matija Mažuranić, Ahmed Muradbegović, and Antun Branko Šimić. Traditional music of Croats of Bosnia and Herzegovina is related to ganga, klapa, gusle, tamburica and šargija. Those ways of singing and musical instruments are part of Bosnian Croat national identity. Ganga, klapa and gusle are mostly widespread on territory of western Herzegovine, even though those can be seen in eastern Herzegovina and Bosnia. Tamburica is popular in Posavina and central Bosnia. Šargija is widespread in northern Bosnia, from Posavina to Olovo and Vareš. With mixture of traditional and modern music, modern Bosnian music was represented by Indexi, Bijelo dugme, Ambasadori and others. The most known singers of modern Bosnian Croat music are Đorđe Novković, Željko Bebek and Jura Stublić. Some new known singers include Mate Bulić, Ivan Mikulić, Nikša Bratoš, Ivana Marić, the Feminnem girl band, and others. Some other well known Croatian singers originate from Bosnia and Herzegovina, including Ivo Fabijan, Boris Novković, Vesna Pisarović and others. There are two significant music festivals, Melodije Mostara (Melodies of Mostar) and Etnofest Neum on which musicians from Croatia also participate. Alongside traditional music, some other musical genres also developed, like heavy metal, hip hop, house and techno. St. James Church in Međugorje. Croats form the core of the Catholic Church in Bosnia and Herzegovina. The metropolitan diocese is the Archdiocese of Vrhbosna. There are also dioceses centered in Banja Luka and Mostar, of which Mostar is the largest. Vinko Puljić is the current Cardinal and Archbishop of Vrhbosna. The Cathedral of Jesus' Heart in Sarajevo is the largest cathedral in Bosnia and Herzegovina, and is the seat of the Roman Catholic Archdiocese of Vrhbosna. 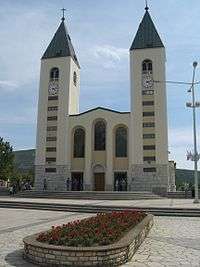 The other three Roman Catholic cathedrals in Bosnia and Herzegovina are the Cathedral of Saint Bonaventure in Banja Luka, the Cathedral of Mary the Mother of the Church in Mostar, and the Cathedral of the Birth of Mary in Trebinje. There are numerous monasteries throughout the region. The oldest is the 14th century Monastery of the Holy Spirit located in Fojnica in central Bosnia, which houses a large library filled with many historical documents dating back to medieval Bosnia. Two other well-known monasteries are the Guča Gora Monastery near Travnik and Kraljeva Sutjeska Monastery near Kakanj, both located in central Bosnia. The rest of the monasteries in the region are the Monastery of St. Anthony in Sarajevo, the Monastery of St. Mark in Derventa, Gorica Monastery in Livno, and the Assumption of Mary Monastery in Prozor-Rama. Oldest saved church in Bosnia is Old Church of St. Michael in Vareš. It has been built before the 16th century. The parish of Međugorje is a significant Marian shrine which attracts approximately one million visitors annually. It became a popular site of religious pilgrimage due to reports of apparitions of the Virgin Mary to six local Catholics in 1981. Over a thousand hotel and hostel beds are available for religious tourism. Stadion Pecara in Široki Brijeg, home of the football club. Croatian-run clubs in Bosnia and Herzegovina number among the country's most successful. They are well represented in terms of national championships in relation to the percentage of Croats in the population. In football, NK Zrinjski Mostar, NK Široki Brijeg, NK Žepče, NK Posušje, and HNK Orašje are some of the most successful. Collectively, they have won three national Cup and five national Championships since national competition began in 2000. Other Croatian-run clubs are NK Brotnjo, NK SAŠK Napredak, HNK Ljubuški, HNK Sloga Uskoplje. The clubs are often among the nation's most multi-ethnic. Prior to 2000, the Croats ran their own football league. However, they have joined the UEFA-approved Football Association of Bosnia and Herzegovina's league system. Bosnia and Herzegovina has produced many successful internationals, both for the Croatian national team and the national team of Bosnia and Herzegovina. ↑ Englar 2007, p. 23. 1 2 3 Frucht 2005, p. 420. ↑ Čuvalo 2010, p. 74. ↑ Džino 2010, p. 1. ↑ Mandić 1974, p. 109. ↑ Vulliamy 1994, p. 227. ↑ Pinson 1996, p. 3. ↑ Frucht 2005, p. 421. ↑ Pinson 1996, p. 6. ↑ Malcolm 1995, p. 15. ↑ Ibrahimagić 1996, p. 100. 1 2 Zlopaša 2005, p. 23. ↑ Pinson 1996, p. 11. ↑ Duhan-Kaplan 1995, p. 293. ↑ Zlopaša 2005, p. 24. ↑ Malcolm 1995, p. 73. ↑ Malcolm 1995, p. 76. ↑ Malcolm 1995, p. 74. ↑ Malcolm 1995, p. 70. ↑ Grandits, Clayer & Pichler 2011, p. 121. ↑ Klaić 1878, p. 98. ↑ Mikaberidze 2011, p. 366. ↑ Herb & Kaplan 2008, p. 1529. 1 2 Klaić 1878, p. 72. 1 2 3 Bilandžić 1999, p. 35. ↑ Maletić 1993, p. 419. ↑ Dizdar 2004, p. 1081. ↑ Donia & Van Antwerp Fine 1994, p. 104. ↑ Donia 2006, p. 105. ↑ Donia & Van Antwerp Fine 1994, p. 104-109. ↑ Klemenčić, Pratt & Schofield 1994, p. 7. ↑ Lukic & Lynch 1999, p. 57. ↑ Bideleux & Jeffries 2007, p. 237. ↑ Bilandžić 1999, p. 82. ↑ Klemenčić & Schofield 2001, p. 10. ↑ Malcolm 1995, p. 155. ↑ Nohlen & Stöver 2010, p. 330. ↑ Velikonja 2003, p. 237. ↑ Nohlen & Stöver 2010, p. 334. ↑ "HOS - Povijest" (in Croatian). HSP Čepin. Retrieved 16 April 2012. ↑ Mulaj 2010, p. 53. 1 2 Malcolm 1995, p. 313. ↑ Malcolm 1995, p. 311-312. ↑ Malcolm 1995, p. 315. ↑ Krešić, Zoran (15 March 2012). "Iz Federacije prognano 230.000, iz RS-a 152.856 Hrvata katolika". Večernji list (in Croatian). Retrieved 27 March 2012. ↑ Malcolm 1995, p. 71. ↑ Klaić 1878, p. 71. ↑ "Bosniaks or Muslims" (PDF). www.seep.ceu.hu. Southeast European Politics Online. Retrieved 2009-07-11. ↑ "Academician Dalibor Brozovic interview". Hrvatska riječ. "chapter title: Important Croats Deserve Special Treatment - (second question) second paragraph". Archived from the original on June 28, 2006. Retrieved 2009-07-11. 1 2 Robbers 2006, p. 117. 1 2 3 4 "Constitution of the Federation of Bosnia and Herzegovina" (PDF). Advokat Prnjavorac. Retrieved 18 June 2012. ↑ "Životopis" (in Croatian). President of the Federation of Bosnia and Herzegovina. Archived from the original on April 19, 2012. Retrieved 18 June 2012. ↑ Čović 2011, p. 5. ↑ Ljubić, Božo (30 October 2009). "Statut Hrvatske demokratske zajednice 1990" (in Croatian). Croatian Democratic Union 1990. Retrieved 23 June 2012. ↑ "Povijest" (in Croatian). Croatian Party of Rights of Bosnia and Herzegovina. Retrieved 23 June 2012. ↑ "Katedrala Srca Isusova u Sarajevu". ktabkbih.net (in Croatian). Katolička Tiskovna Agencija Biskupske konferencije Bosne i Hercegovine. 6 January 2011. Retrieved 15 January 2016. Bideleux, Robert; Jeffries, Ian (2007). The Balkans: A Post-Communist History. Taylor & Francis. ISBN 978-0-415-22962-3. Bilandžić, Dušan (1999). Hrvatska moderna povijest (in Croatian). Golden marketing. ISBN 953-6168-50-2. Bove, Laurence F.; Duhan-Kaplan, Laura (1995). From the Eye of the Storm: Regional Conflicts and the Philosophy of Peace. Atlanta. ISBN 90-5183-870-0. Čović, Dragan (2011). Statut, program, programska deklaracija (in Croatian). Croatian Democratic Union of Bosnia and Herzegovina. Čuvalo, Ante (2010). The A to Z of Bosnia and Herzegovina. Rowman & Littlefield. ISBN 9780810876477. Dizdar, Zdravko (2004). "Djelovanje HKD "Napredak" u Hrvatskoj (1902. - 1941.)". Časopis za suvremenu povijest (in Croatian). 36. Hrvatski institut za povijest. Donia, Robert J.; Van Antwerp Fine, John (1994). Bosnia and Hercegovina: A Tradition Betrayed. C. Hurst & Co. Publishers. ISBN 978-1-85065-211-3. Donia, Robert J. (2006). Sarajevo: A Biography. University of Michigan Press. ISBN 0-472-11557-X. Džino, Danijel (2010). Becoming Slav, Becoming Croat: Identity Transformations in Post-Roman and Early Medieval Dalmatia. Koninklijke Brill. ISBN 978-90-04-18646-0. Englar, Mary (2007). Bosnia-Herzegovina in Pictures. Twenty-First Century Books. ISBN 9780822523932. Franolić, Branko (1984). A Short History of Literary Croatian. Nouvelles éditions latines. Frucht, Richard C. (2005). Eastern Europe: An Introduction to the People, Lands, and Culture. 1. ABC-CLIO. ISBN 1-57607-800-0. Herb, Guntram H.; Kaplan, David H. (2008). Nations and Nationalism: A Global Historical Overview. ABC-CLIO. ISBN 978-1-85109-907-8. Grandits, Hannes; Clayer, Nathalie; Pichler, Robert (2011). Conflicting Loyalties in the Balkans: The Great Powers, the Ottoman Empire and Nation Building. I. B. Tauris. ISBN 978-1-84885-477-2. Ibrahimagić, Omer (1996). Bosanska srednjovjekovna država i suvremenost (in Bosnian). Faculty of Political Science of University of Sarajevo. Kacowicz, Arie M.; Lutomski, Pawel (2007). Population Resettlement in International Conflicts: A Comparative Study. Lexington Book. ISBN 978-0-7391-1607-4. Klaić, Vjekoslav (1878). Bosna (Zemljopis) (in Croatian). Matica hrvatska. Klemenčić, Mladen; Pratt, Martin; Schofield, Clive H. (1994). Territorial Proposals for the Settlement of the War in Bosnia-Hercegovina. International Boundaries Research Unit. ISBN 978-1-897643-15-0. Klemenčić, Mladen; Schofield, Clive H. (2001). War and Peace on the Danube: The Evolution of the Croatia-Serbia Boundary. University of Durham, International Boundaries Research Unit. ISBN 978-1-897643-41-9. Lukic, Rénéo; Lynch, Allen (1999). Europe from the Balkans to the Urals: The Disintegration of Yugoslavia and the Soviet Union. Oxford University Press. ISBN 978-0-19-829200-5. Malcolm, Noel (1995). Povijest Bosne. Novi Liber. ISBN 953-6045-03-6. Maletić, Franjo (1993). Who is Who in Croatia. Golden marketing. ASIN B0000D6QL5. Mikaberidze, Alexander (2011). Conflict and Conquest in the Islamic World: A Historical Encyclopedia. ABC-CLIO. ISBN 978-1-59884-336-1. Mulaj, Klejda (2010). Politics of Ethnic Cleansing: Nation-State Building and Provision of In/Security in Twentieth-Century Balkans. Lexington Books. ISBN 978-0-7391-1783-5. Nohlen, Dieter; Stöver, Philip (2010). Elections in Europe: A Data Handbook. Nomos Verlagsgesellschaft Mbh & Co. ISBN 978-3-8329-5609-7. Pinson, Mark (1996). The Muslims of Bosnia and Herzegovina: Their Historic Development from the Middle Ages to the Dissolution of Yugoslavia. Harvard CMES. ISBN 978-0-932885-12-8. Robbers, Gerhard (2006). Encyclopedia of World Constitutions. Infobase Publishing. ISBN 9780816060788. Vulliamy, Ed (1994). Seasons in Hell: Understanding Bosnia's War. Simon & Schuster. ISBN 0-671-71345-0. Zlopaša, Ivan (2005). Politička sudbina Hrvata u BiH (in Croatian). Hrvatski blok. Wikimedia Commons has media related to Croats of Bosnia and Herzegovina.